The health benefits of unicycling are hard to ignore, as it is known to be great for the body, but also for the mind. In the Excy XCS 200 series, we’ve worked on bringing you a unicycle exercise bike experience for the ultimate in fun and fitness. We are also big fans of the old StairMasters and have incorporated a stair stepping experience. Not only will these two positions tone your legs and buttocks, but they will also work your core. With our freestyle approach that puts you in charge of your cadence, cranking, and spinning, you will never get bored because you can always mix it up. The Excy unicycle exercise bike and stair-stepping is only available in the XCS 200 series (unavailable in the XCS 220). Unicycle Exercise Bike at Home, Work, or On the Go! Riding Excy as a unicycle exercise bike is an amazing cardiovascular and strength-training workout that isn’t harsh on your joints. You will work your calf muscles, core muscles, and quads in ways that is beneficial for multiple sports and activities. Because Excy does not have handlebars or a wheel, riding Excy in the unicycle position requires that riders hold onto something sturdy while also maintaining balance using their abdominal muscles and leg muscles. You can burn some serious, but also focus on increasing your levels of coordination, concentration, and balance. Resistance is bi-directional, so riders can freestyle spin forwards and backwards. If you are looking for a tough machine to work on balance and tone your entire lower body and core, explore Excy as stair-stepping machine. The closest we can describe this experience is like the old school StairMasters where you feel like you are climbing or running stadium stairs, but we do it with 2-70 pounds of resistance with nearly zero impact on joints. If you have a sports injury, with the direction of your physical therapist, this can be an amazing way to regain your balance and leg strength. You are in control of the stepping speed and intensity. You must use hiking polls, a wall, a ledge, or even your stand-up desk for balance. To use Excy as a stepping machine, you simply crank back and forth with equal resistance in both directions vs. a full rotational cycle. It’s an amazing full body strength training and cardio workout. 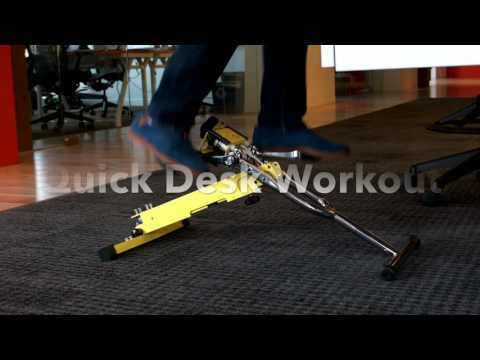 Explore Excy as a Unicycle Exercise Bike and Step Cycle at Home, Work, or On the Go!